Posted by KDA in art, Canadian Tibetan Artist, Chuba, Chuba, Contemporary Tibetan Art, Contemporary Tibetan Artist, culture, Fashion, Heritage, Musical Performances, Public event, Tibetan art, Tibetan art exhibit, Tibetan Arts and Culture, Tibetan Chuba, Tibetan Clothing, Tibetan Culture, Tibetan Designer, Tibetan Designs, Tibetan Dress, Tibetan Heritage, Tibetan Photographer, Toronto Tibetan artist, traditions. At the JCCC’s 11th Road to Asia weekend festival on Sunday November 6, DreBu presented a Tibetan musical performance on main stage showcasing the beautiful five elements Chuba collection. 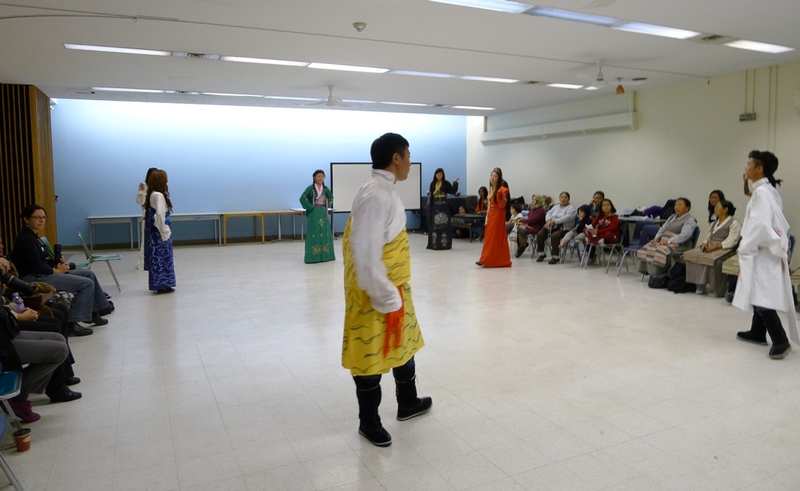 The dance was choreographed by musician/performance artist Tseten and designer/artist Kalsang . The performance team also included 4 youth who worked hard at mastering the steps through a few rehearsal sessions. The outcome was a wonderful performance to an audience of over 300 people. The Five Elements Collection was exhibited at the Heritage Display for a month in November. Road to Asia festival weekend was visited by over 300o people. 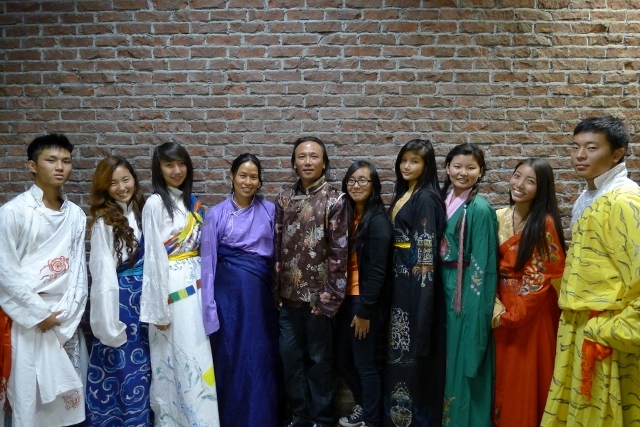 Introduction to the Tibetan performance was made by Gelek, co-founder of Drebu. 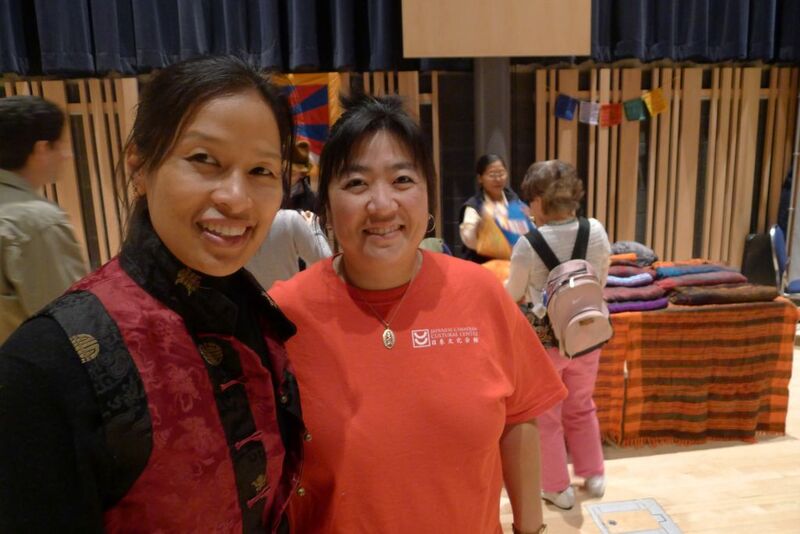 Our dedicated volunteers at the event were Jamyang Dorjee and Cindy Laparra. Thank you to all our performers and volunteers! To view picture album on facebook, click here. To watch the video of the performance, visit here. Copyrights for all contents 2009-2016 DreBu. All rights reserved. Posted by KDA in art, Canadian Tibetan Artist, Chuba, Contemporary Tibetan Art, Contemporary Tibetan Artist, culture, culture days 2011, Fashion, free, Heritage, Musical Performances, Photography, Public event, Tibetan art, Tibetan art exhibit, Tibetan artist, Tibetan Artist in Canada, Tibetan Arts and Culture, Tibetan Chuba, Tibetan Clothing, Tibetan Culture, Tibetan Designer, Tibetan Designs, Tibetan Dress, Tibetan Heritage, Tibetan Photographer, Toronto Tibetan artist, traditions. 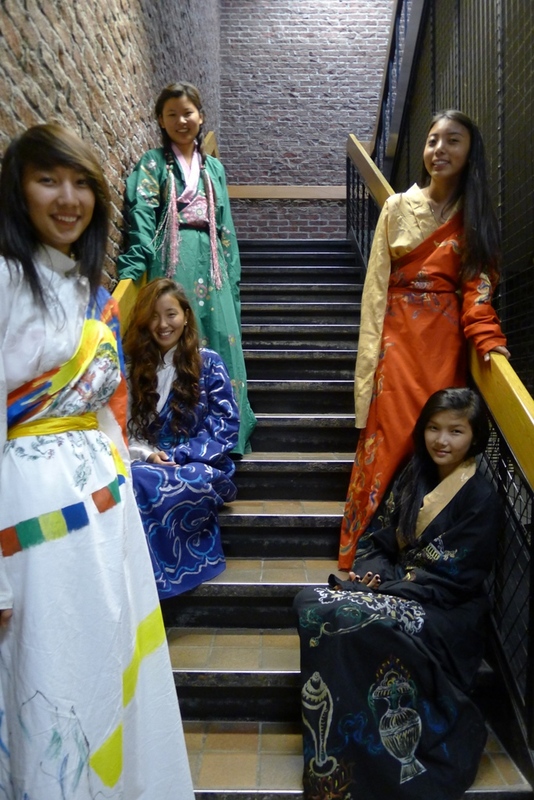 In celebration of this year’s Canada Culture Days, DreBu presented “Tibetan Chuba: Ancient Dresses in Modern Times”, on Saturday, Oct 1, 2011. The collection of seven original Tibetan dresses was designed and hand-painted by Kalsang Dolma, a Canadian – Tibetan artist based in Parkdale, Toronto. Seven youth models presented the colorful dresses in a series of orchestrated movements and demonstrations. 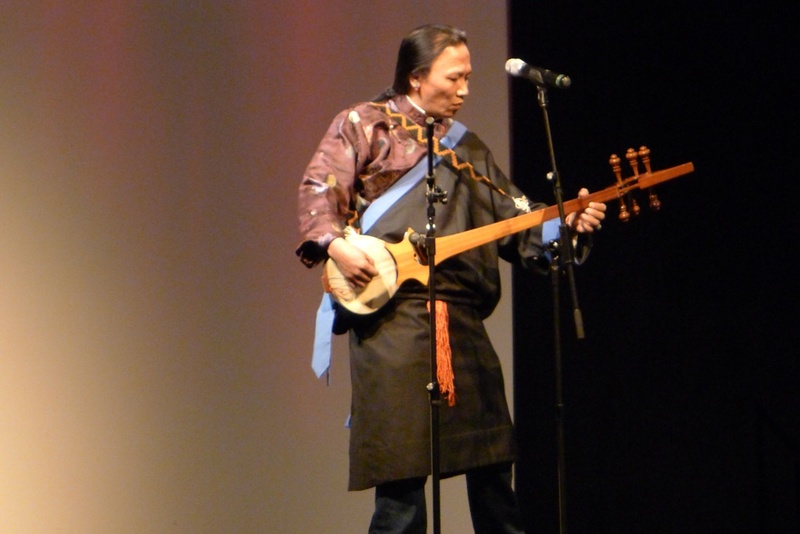 The show was accentuated by the live musical performances of Tsewang and Kunsang. 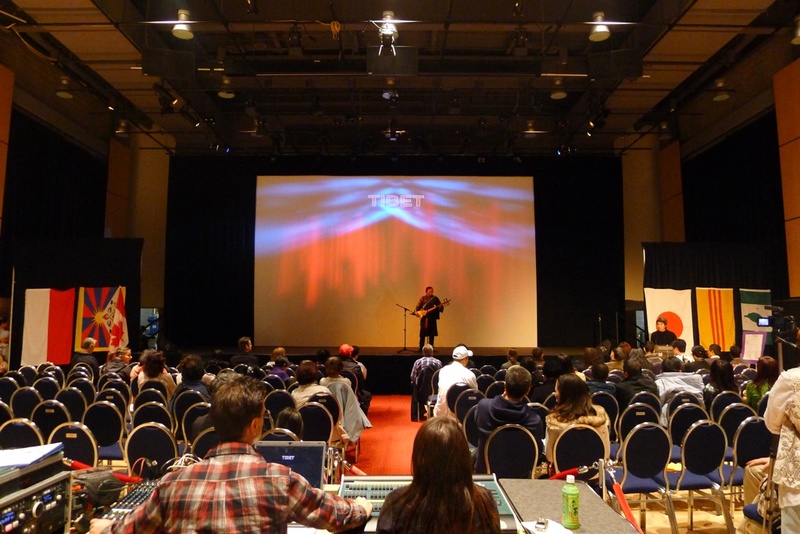 More than sixty people attended this show through the course of the day. By paying homage to the traditional Tibetan motifs in a contemporary setting, Ms. Dolma hoped to highlight the importance of cultural understandings and community-based arts initiatives. The event was held at the Parkdale Public Library. For the photo album on DreBu’s facebook page, visit/click here. THANK YOU! We look forward to seeing you at our next presentation/exhibit in the first week of November at Road to Asia Festival 2011. Our special Thanks to Ms. Tenzin Khando in supporting us with a generous donation towards marketing cost (posters, printing) and honorarium to our musicians. Thank you for your support! Slide show of more pictures from the event, click below and enjoy! © Copyrights 2011 DreBu – All rights reserved. 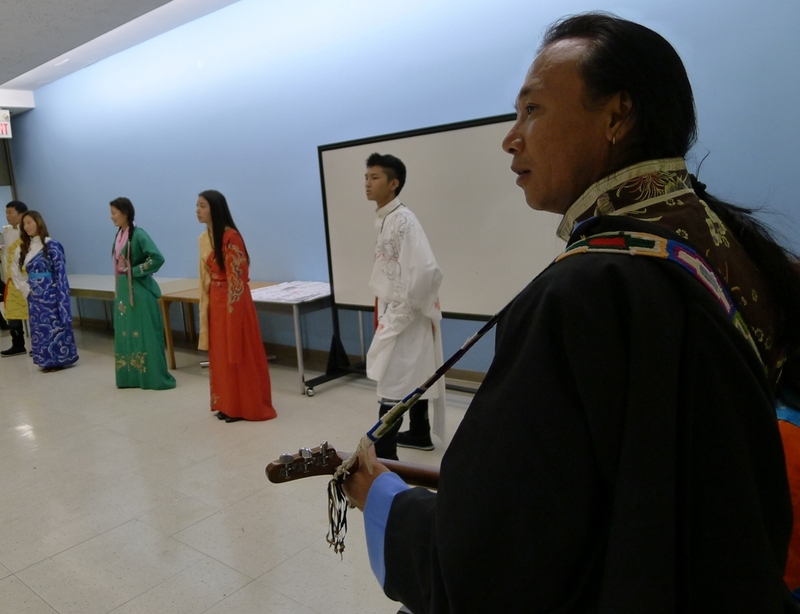 Posted by KDA in art, culture, culture days, culture days 2011, free, Musical Performances, Public event, Tibetan art, Tibetan Arts and Culture, traditions. Drebu will present a live, interactive, fashion, art and live music event in Parkdale Library on Saturday, Oct 1st from 11 to 2 pm; highlighting the importance of connecting with the diverse traditions and cultures that make up the Canadian mosaic. Models will present a collection of modern Tibetan dresses styled after traditional forms and painted with bold ancient motifs in a contemporary painting medium by Kalsang Dolma, a Canadian Tibetan Artist & Designer . The collection will be presented by models through graceful Tibetan dance movements to live traditional music, along with demonstrations of various styling possibilities. The online exhibition of the collection (Click here) goes live on September 30th, Friday. It will provide a view of the complete collection and its artistic production process, showing how artistic traditions and heritage tie in beautifully and organically with modern (urban) arts and culture. Participants will have the opportunity to engage with the artists and models in a discussion on dress styling, history and meanings behind the painted motif designs. The presentation highlights the importance of connecting with the diverse traditions and cultures that make up the Canadian mosaic. This approach in presenting and sharing an integral aspect of our lives to a wider audience will serve to help us appreciate our cultural and artistic diversity through an engaging and innovative process that aims to cultivate a sense of true sharing and inclusion. The presentation also serves to inspire and encourage our younger generations to have a sense of pride in our arts, traditions and diverse identities. Open to all age group for a fun and interactive experience! To learn more about the presentation and Culture Days 2011, please visit online. Posted by KDA in art, culture, free, Musical Performances, Public event, Tibetan art, Tibetan Arts and Culture, Tibetan Food, traditions, Uncategorized. Over 3000 people from all over GTA enjoyed Road to Asia 2010 festival during its 10th anniversary weekend on Nov 6th and 7th . 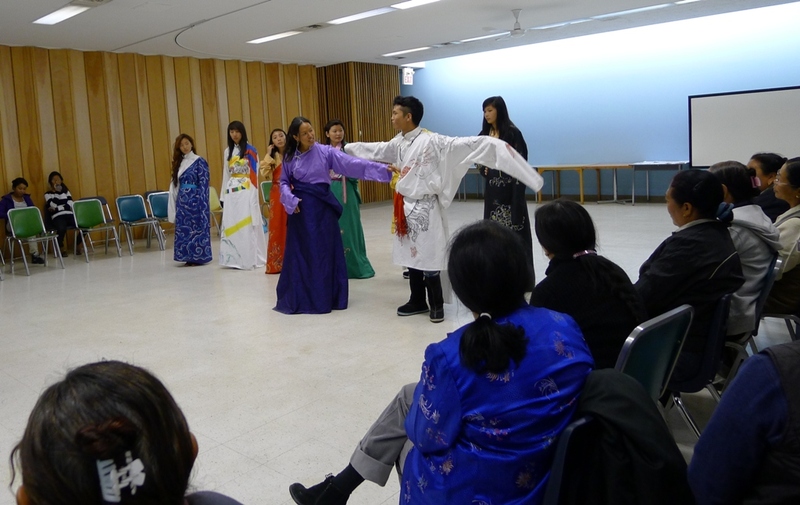 DreBu was happy to be part of the best of Asian cultures sharing our traditions and arts through music, performance and food. Tsetan Lhudrup was the featured performing artist for the Tibetan cultural music and dance; he performed a couple of popular songs on his dranyen. 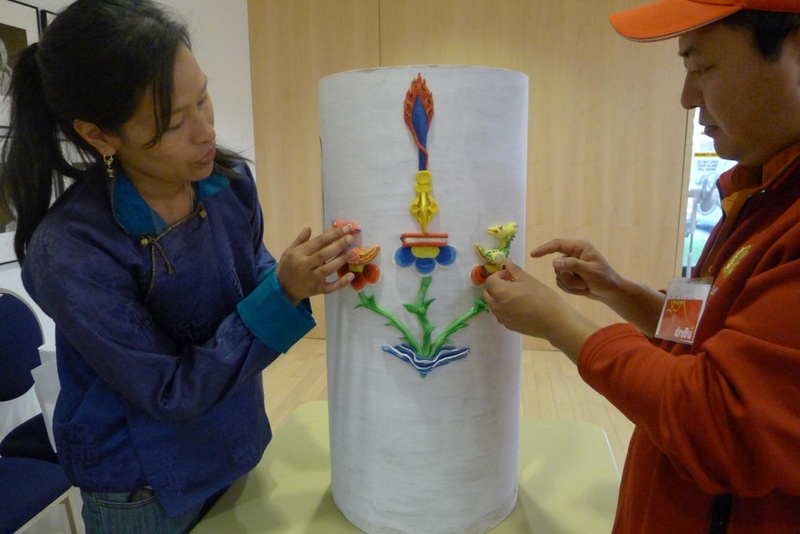 DreBu organized an art demonstration using a cyclindrical pillar-like model (paper board material) where Tibetan architectural and colorful motifs are put up with sculptural clay material using the art of Tibetan butter sculpture known as “KarGyen” in Tibetan. 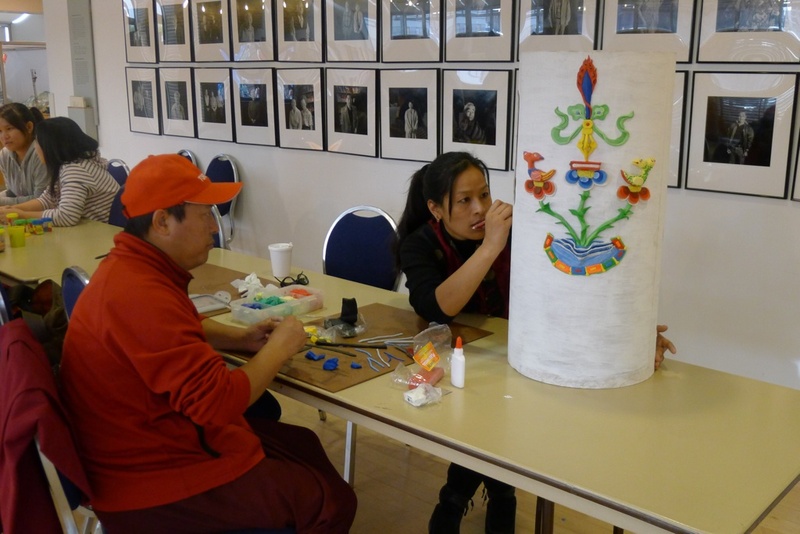 Throughout the festival weekend, Ngawang and Kalsang worked on it from scratch; drawing the design sketch first and then laying and filling them out with the colorful clay. The completed peice will be displayed in 2011. DreBu sold Tibetan momos and noodles to raise funds in order to meet with the participation expenses to pay our artists and performers. 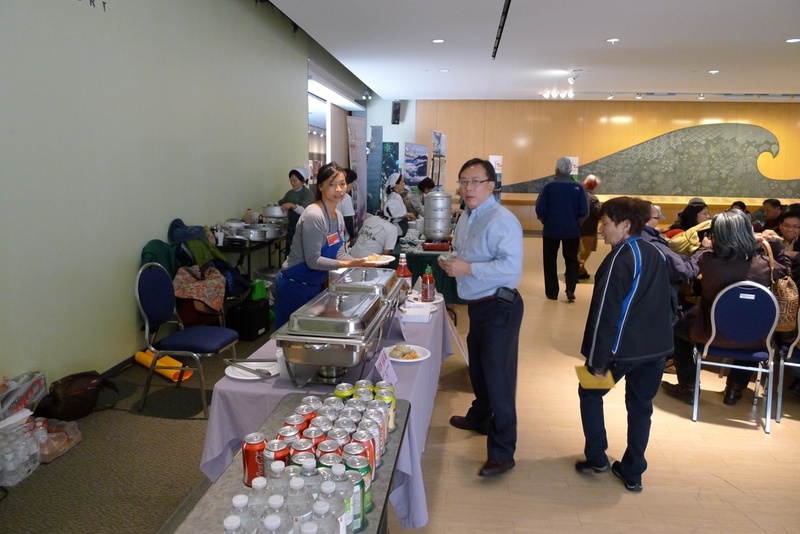 The participants were appreciative of the authentic taste of the beef and vegetarian dumplings! DreBu believes in supporting our professional artists by compensating for their works which encourages them to continue to work in their artistic skills and to pass on the knowledge through sharing with the younger generation members of the communities and the public at large. Last but not the least, DreBu thank all the volunteers to make our participation at the 10th Road to Asia a success! Thank you to Jamyang Dorjee, Lobsang Rapten, Norbu Samten Naftel, Tenzin Pelmo, Tenzin Namsel, Norbu Dhundup and Tsering Dickyi. We look forward to coming back in 2011 with a surprise presentation. Copyright 2009-2011, DreBu. All rights reserved.